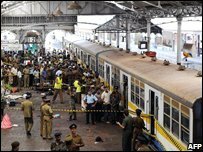 At least 11 people have been killed and nearly 100 injured in a suicide attack at the main railway station in Sri Lanka's capital Colombo. A female suicide bomber blew herself up as a suburban train pulled into a station platform, police said. The attack comes amid increased security ahead of celebrations on Monday to mark the 60th anniversary of Sri Lanka's independence from Britain. On Saturday, 18 people died in a blast in the central town of Dambulla. Both attacks have been blamed on Tamil Tiger militants, although the group has denied responsibility. The rebels, who have been fighting for an independent state in the north and east since 1983, have carried out frequent suicide and bomb attacks in the city and other areas. The civil war has intensified in the last month, after the government pulled out of a ceasefire with the rebels, and said its new aim was to wipe them out. As police cordoned off the blast area on Sunday, eyewitnesses described the scene. "I was near my counter and I heard a big blast. When I looked behind I saw a policeman bleeding," said ticket inspector Ravindra Pinto. "As I took him and rushed out, I saw many men and women on the ground," he said. Colombo station is situated in the heart of the city, near the president's offices and several major hotels. The BBC's Roland Buerk in Colombo says people are concerned that there may be more attacks to coincide with the anniversary. 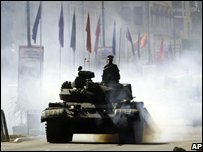 Huge parades have been planned in the city, large parts of which have been closed off. A bomb attack on the city zoo earlier on Sunday injured four people. The blast, near an aviary, is thought to have been caused by a grenade.